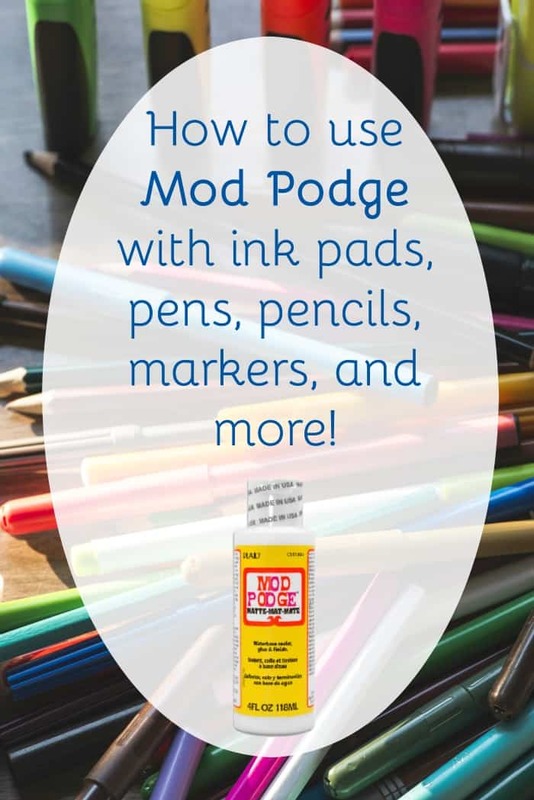 How well does Mod Podge work with ink pads, pens, pencils, and markers? Which cause smearing when applied over/under? Find out here! It's not asked exactly that way every single time (that would be amazing), but it's pretty close. I got embarrassed for awhile when I did get asked because I couldn't remember the answer. “Wait,” I'd say to myself, “does that ink pad work on top of Mod Podge or below it . . . or both?” Plus I'm getting older and who can keep track of all that?! It made the most sense to do this experiment and write it all down in a post, which is what I'm doing here. For this experiment, I applied each item to a piece of white scrapbook paper – all items were applied to the exact same type of paper, which is the type you can get in the scrapbooking aisle at your local craft store. Each item was allowed to sit/dry for 20 minutes before Mod Podge was applied, even if it didn't technically need “dry time.” I also brushed over each item about 3 – 4 times with Mod Podge and a regular paint brush. Here are the results of the smear test. Successful means that the item didn't smear when Mod Podge was applied on the top – and I would endorse using this product with Mod Podge over the top with no hesitation. Any other result is explained. Watercolor pencils – moderately successful. On about the third or fourth brushstroke, I started to get some smearing. 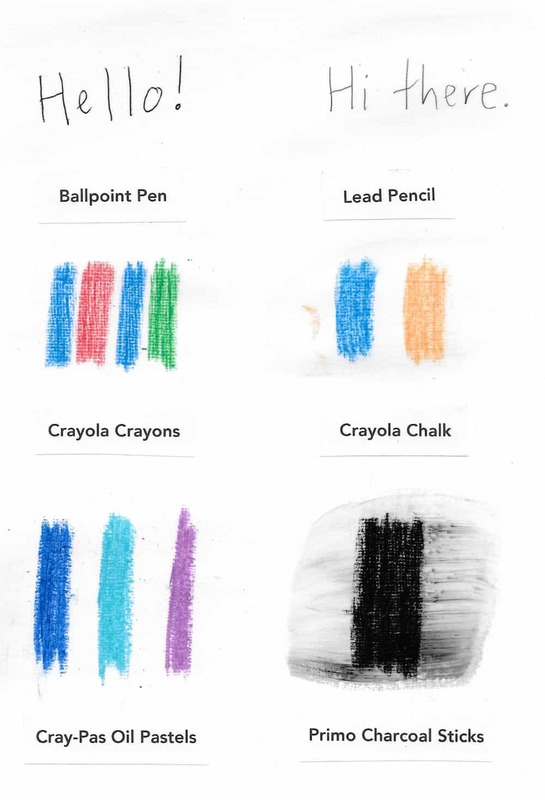 This makes sense because the watercolor pencils are water activated, and Mod Podge is a waterbased product (so the pencils are acting as they are supposed to). Crayola chalk – moderately successful. Seems like some of the dust from the chalk got caught in the Mod Podge/brush and started smearing, even though I blew the dust away. Primo charcoal sticks – unsuccessful. No surprise here. I didn't expect this to work since the idea of charcoal sticks is that they smear. But I wanted to see what happened and show the results! CraftSmart ink pad – unsuccessful. There's a smear though it's very slight. Colorbox ink pad – unsuccessful. Moderate smear. Encore! ink pad – unsuccessful. Major smearing! 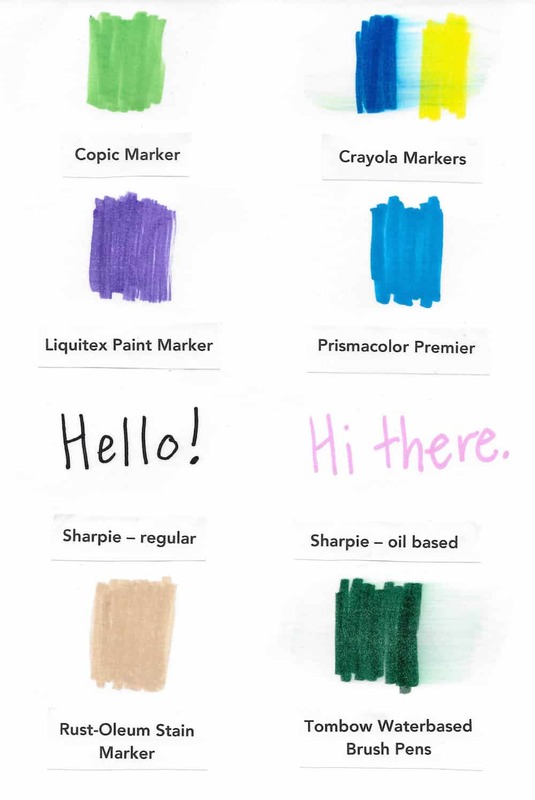 Crayola markers – unsuccessful. Major smearing. Tombow waterbased brush pens – unsuccessful. If you're going to Mod Podge with markers, I'd suggest sticking with some of those above that worked! For this experiment, I applied Mod Podge to the scrapbook paper in approximately two layers and let it dry for 30 minutes – an hour depending on the page. 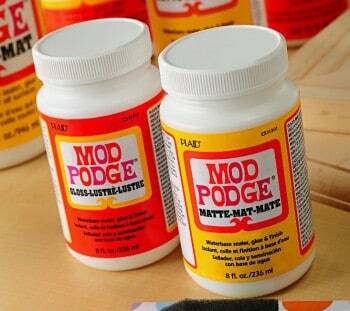 Basically, you would want your Mod Podge to be dry to the touch for this. Once the Mod Podge was dry, I applied the item on top, THEN I let that dry for 20 minutes. The last step was to run my finger across it to see if it smeared. Here are the results of the smear test. Successful means that the item didn't smear with my finger when applied ON TOP OF Mod Podge – and I would endorse using this product on top of Mod Podge with no hesitation. Any other result is explained. 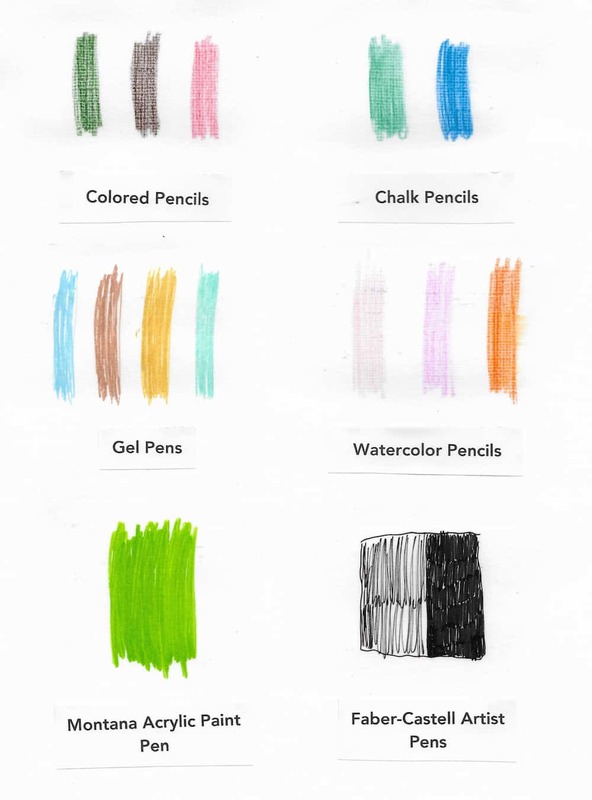 Colored pencils – unsuccessful. Very difficult to apply to paper, even with pressure. 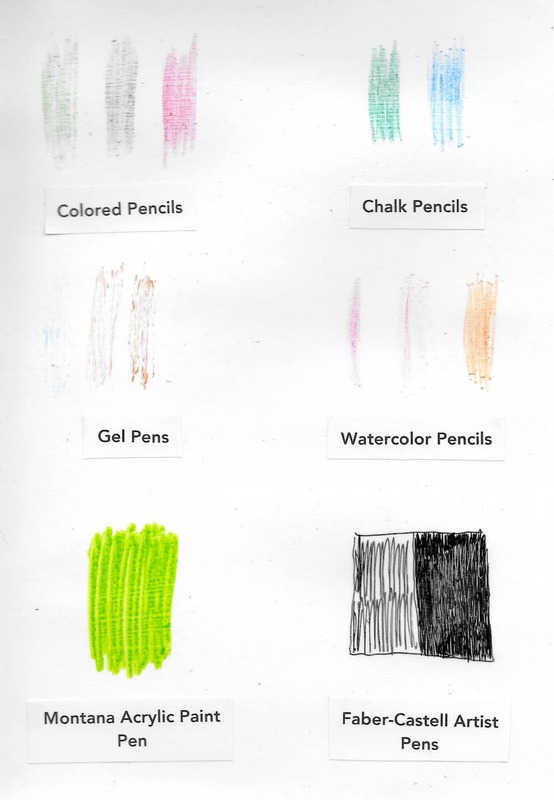 Chalk pencils – unsuccessful. Same as above. Gel pens – unsuccessful. Could barely see application to page. Watercolor pencils – unsuccessful. Some colors worked better than others, but none were great. Montana acrylic paint pen – moderately successful. While the pen did apply successfully, it was hard to fill in areas. If you were just writing letters, you'd be fine. Coloring in areas would be more difficult. Faber-Castell artist pens – moderately successful. While the pen did apply successfully, it was hard to fill in areas. If you were just writing letters, you'd be fine. Coloring in areas would be more difficult. Ballpoint pen – moderately successful. I'd say you're going to need to test here, depending on your pen. Mine worked okay, but not every stroke resulted in a line. Lead pencil – unsuccessful. Very difficult to write. 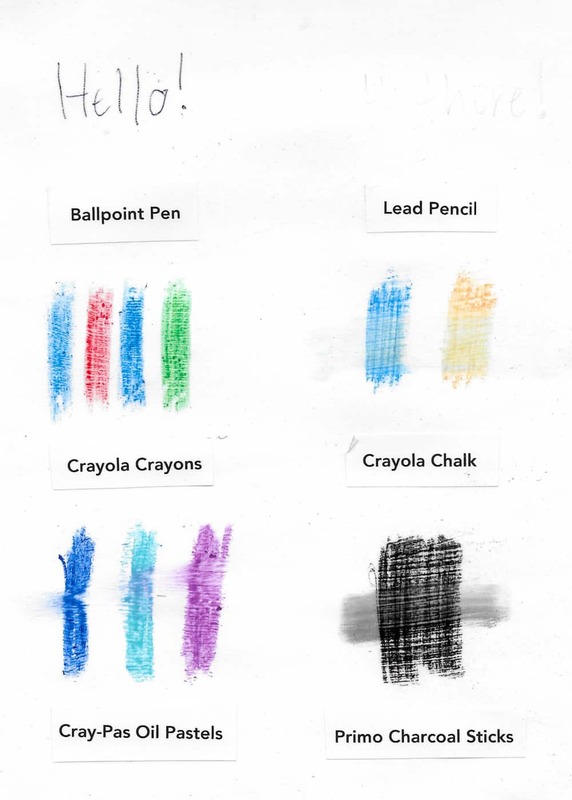 Crayola chalk – unsuccessful. Smeared right off. Cray-Pas oil pastels – unsuccessful. Smeared. Primo charcoal sticks – unsuccessful. No surprise here – smeared. 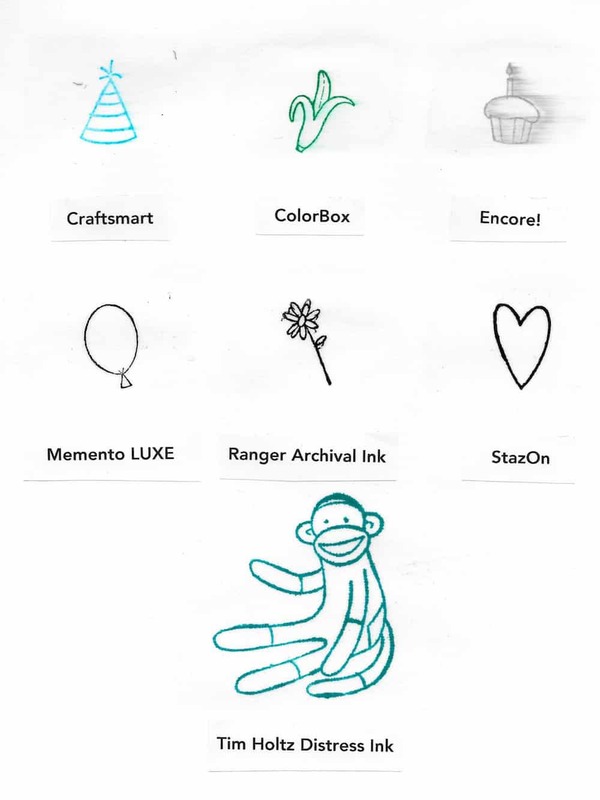 Colorbox ink pad – unsuccessful. Rubbed right off easily. Encore! ink pad – unsuccessful. Major smearing. 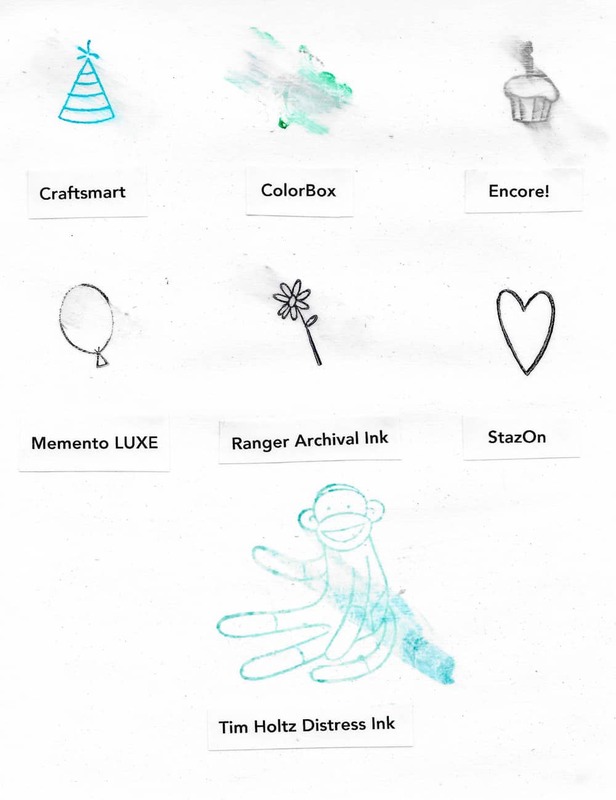 Memento LUXE ink pad – unsuccessful. Moderate smearing. Ranger Archival Ink –unsuccessful. Slight smearing. Tim Holtz Distress Ink –unsuccessful. Definitely do your distressing of paper before Mod Podging! Copic marker – moderately successful. A little more difficult to fill in areas completely without lines. Liquitex paint markers –moderately successful. A little more difficult to fill in areas completely without lines. 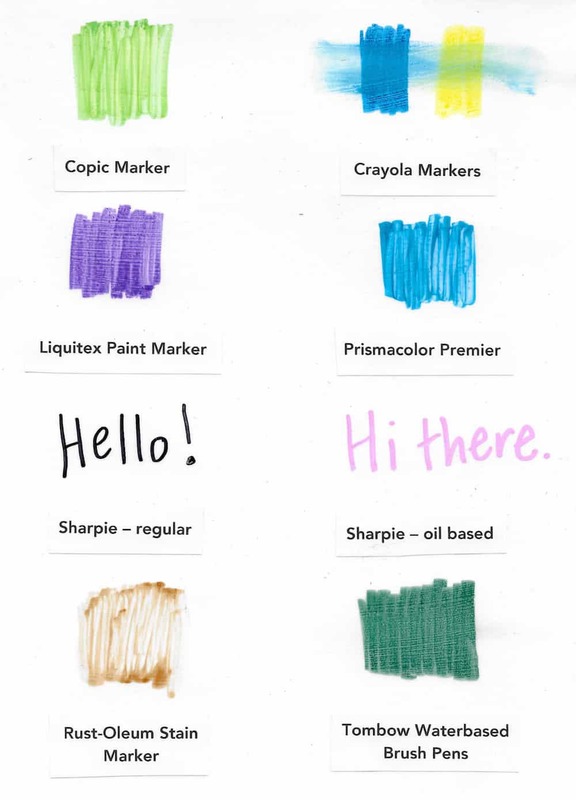 Prismacolor Premier markers –moderately successful. A little more difficult to fill in areas completely without lines. Rust-o-leum stain marker – unsuccessful. Too many lines and I didn't feel like I could color in the areas very well at all. So those are the results. I'd love to hear your experiences – and any questions – in the comments!